Hedican et al. reported a multi-institutional complications report including 196 patients undergoing various hand-assisted laparoscopy renal procedures (56). Procedures included 57 radical nephrectomies, 50 donor nephrectomies, 38 nephrouretectomies, 24 partial nephrectomies, 2 simple nephrectomies, and 2 other renal procedures. The data showed that 28 patients (14%) had minor complications, including urinary retention in 11 and prolonged ileus in four. Of the patients, 9.2% suffered major complications, including small bowel injury (3), hemorrhage requiring conversion (3) and reintubation (3). There were 12 (6.2%) intraoperative complications. Multiple complications occurred in 11 patients, accounting for 46% of all the complications. There were only two delayed complications, including one port site hernia and one small bowel obstruction (57). It is important to emphasize that these institutions were pioneers of the approach, and many of the procedures were on the learning curve. Conceptually, hand assistance should reduce complication rates, particularly intraoperative complications. More rapid dissection, better hemostasis, and more rapid identification of structures are all well publicized benefits of hand-assisted laparoscopy. In contrast, potential added risks of hand-assisted laparoscopy include incisional complications, namely wound infection or hernias (see below), and inadvertent bowel or adjacent organ injury due to the presence of the intra-abdominal hand, which sometimes is not always in view laparoscopically. Similarly, concerns of increased abdominal pain, and higher risks of ileus as compared to standard laparoscopy may be part of the postoperative expectations of patients undergoing hand-assisted laparoscopy procedures. The morbidly obese are a controversial subgroup in laparoscopy. Hedican et al. (58) reported that hand-assisted laparoscopy was not only safe but also in fact beneficial in the obese subgroup. They also assessed the profoundly obese (body mass index > 40) and found those patients doing similarly well. This finding is in contrast to the report of Mendoza et al. (59), which showed a greater risk of complications in the morbidly obese with standard laparoscopy. However, this study was a multicenter trial published in 1996, and thus may reflect technology and the global status of laparoscopy at that time. More recent data in standard laparoscopy have shown a similar complication rate in the morbidly obese (60). It is the authors' belief that hand-assisted laparoscopy is particularly useful in the obese population, because the hand incision may be less significant in this patient subgroup. Moreover, these patients have capacious abdomens, which also favor the use of hand-assisted laparoscopy. Finally, neuromuscular complications are worthy of note. Wolf et al. (61) reported a 2.7% risk of neuromuscular complications during laparoscopy, and although some cases in this series were hand-assisted laparoscopy procedures, the shortened operating room time for hand-assisted laparoscopy should decrease the risk of neuromuscular injury. 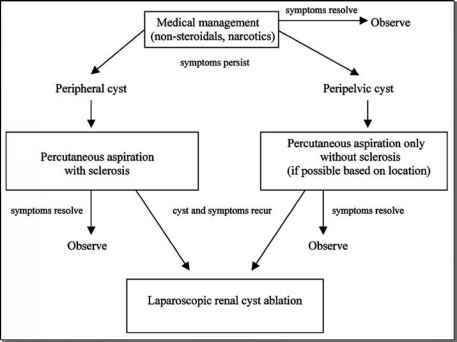 Additionally, positioning for hand-assisted laparoscopy does not require as aggressive a flank position as standard renal surgery. Conversely, hand-assisted laparoscopy appears to produce more physical pain in some body parts of the surgeon than does standard laparoscopy (62).